If you are looking for peace and quiet, we have the cabin for you! Sleepy Bear Hollow is a large spacious cabin that sits atop a knoll at the bottom of a mountain with a beautiful river running in front of it. There's tons of room both inside and outside the cabin and you most likely will even see deer grazing in the front yard. The fire pit sits right alongside the river, where there's a deep hole for swimming but no diving please! The fisherman in the family can step outside the cabin and walk a very short distance and spend his or her day on the riverbank, pulling in trout. A separate building houses the pool table which also has a ping pong insert and the hot tub sits on the porch for those who like to unwind after a long day of fishing or hiking. 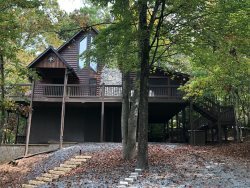 This cabin is conveniently located in the Whitepath area which is halfway between Ellijay and Blue Ridge, only a 10 minute drive to either town, giving you easy access to both towns when you are ready to see what they have to offer. Don't miss out on this fabulous cabin. *This cabin doesn't require picking a key up at the office. Instructions will be sent with confirmation. Lockbox on premises. The property was fantastic. The yard was perfect for the boys to play as we had a water gun war. The game room was awesome, we had pool table competitions. A very relaxing place to get away from it all.